Forza Horizon 3 is coming on September 27 and now is the time to secure your ticket to the ultimate automotive party. Explore the amazing beauty and spectacular beauty of Australia in more than 350 fully realized Forzavista™ cars and, this time, you are in charge of the Horizon Festival. For all the details on Forza Horizon 3, go read our epic preview story of the game. Starting today, you can choose from one of three versions for Forza Horizon 3, available to everyone. Note that players who purchase any digital bundle of Forza Horizon 3 on Xbox will also receive two car packs available immediately for use in previous Forza games – the Rockstar Energy Car Pack from Forza Horizon 2 and the Meguiar’s Car Pack from Forza Motorsport 6. The Forza Horizon 3 Standard Edition includes Forza Horizon 3 and a special pre-order bonus car tied to participating retail outlets. Go here to purchase. The Forza Horizon 3 Deluxe Edition includes Forza Horizon 3, the pre-order bonus car, VIP membership, as well as the Forza Horizon 3 Motorsport All-Stars Car Pack. Go here to purchase. The Forza Horizon 3 Ultimate Edition includes Forza Horizon 3, the pre-order bonus car, VIP membership, as well as the Forza Horizon 3 Motorsport All-Stars Car Pack. Ultimate Edition owners will also get the Forza Horizon 3 Car Pass and will be granted early access to play Forza Horizon 3 beginning on 9/23/16, a full four days before the game is released to general availability. Go here to purchase. See below for details on pre-order bonus cars, the Motorsport All-Stars Car Pack, VIP membership, and the Forza Horizon 3 Car Pass. Those outside of the U.S. should check with their local participating retailers to see which cars will be available per outlet. 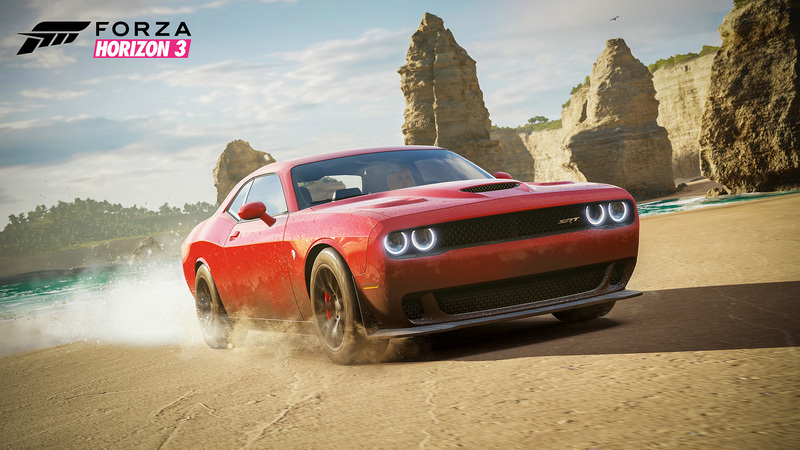 The Dodge Challenger Hellcat pre-order car for Forza Horizon 3. The Motorsport All-Stars Car Pack for Forza Horizon 3 is your chance to take 10 of the hottest modern race cars off the track and out on the open road. This pack includes the 2016 Ford #66 Racing GT Le Mans, the 2014 Audi #45 Flying Lizard Motorsports R8 LMS ultra, the 2014 Chevrolet #3 Corvette Racing Corvette C7.R, the 2014 Dodge #94 SRT Motorsports Viper GTS-R, the 2014 Ferrari #51 AF Corse 458 Italia GTE, the 2015 Nissan #1 NISMO MOTUL AUTECH GT-R, the 2015 Lamborghini #63 Squadra Corse Huracán LP620-2 Super Trofeo, the 2016 Holden #22 Sharkbite HRT VF Commodore, the 2016 Ford #55 Supercheap Falcon FG X, and the 2014 #55 BMW Team RLL Z4 GTE. Exclusive cars, new events, and more await with Forza Horizon 3 VIP membership! Forza Horizon 3 VIP members receive five exclusive VIP cars, including the 2016 Lamborghini Aventador LP750-4 SV, the 2-016 Koenigsegg Regera, the 2015 Ultima Evolution Coupe 1020, the 2015 Ferrari F12tdf, and the 2015 Ford Falcon GT F 351. VIPs will receive additional benefits such as VIP wheel spins with extra rewards each time you level up, access to exclusive online events, community gifts, and more. 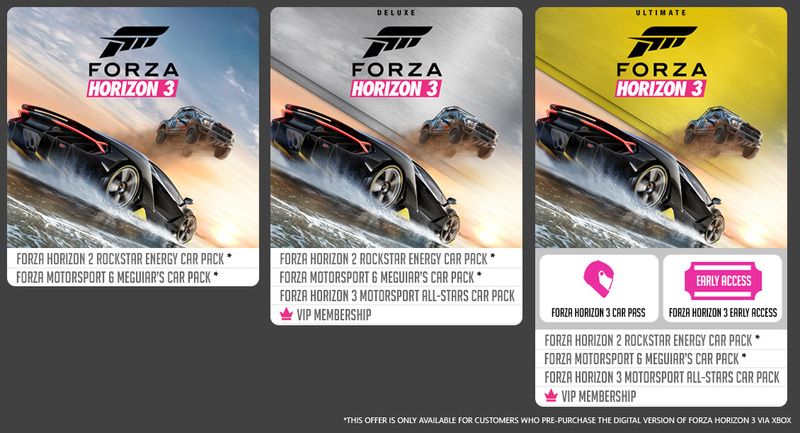 Get your VIP membership today, only through the Deluxe or Ultimate Editions of Forza Horizon 3. 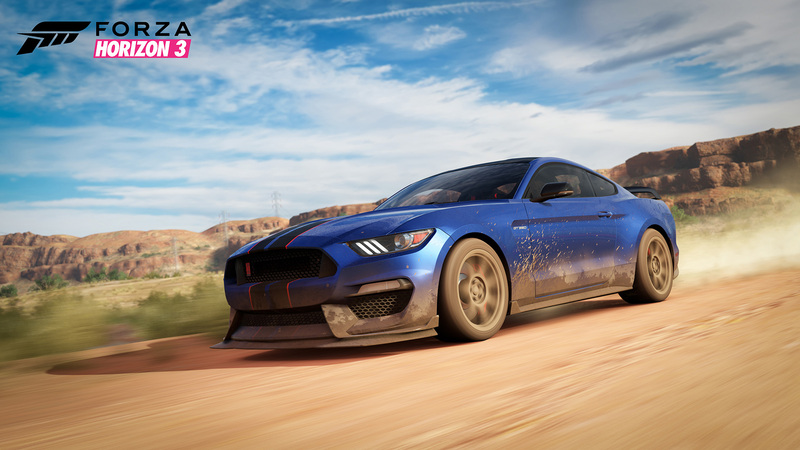 The Ford Shelby GT350R pre-order car for Forza Horizon 3. With the Forza Horizon 3 Car Pass, you’ll always be dialed in to the latest and greatest cars in Forza Horizon 3. The Car Pass brings you six monthly car packs (7 cars each) beginning in October 2016. That’s 42 amazing cars total, all waiting to be collected, customized, and raced, for one low price. Your epic adventure through Australia begins this September with the launch of Forza Horizon 3. Apart from all the great content we have coming for pre-ordering, you can earn even more great stuff through our Forza Rewards loyalty program. To learn more about how Forza Rewards will work in Forza Horizon 3, check out the story.